our homeland Indonesia is a country which produces plants with which serves as a natural ingredient to prevent and treat various diseases. Planting medicinal plants is the right thing to do as an initial action for treatment. Home page could you make as a refreshing eye amusement park, but it does not hurt if your home page planted some medicinal plants that are useful to you. Leaves famous meniran effectively help improve immune function. Meniran leaves this time is used as a natural material and used as herbal medicine packaging form. 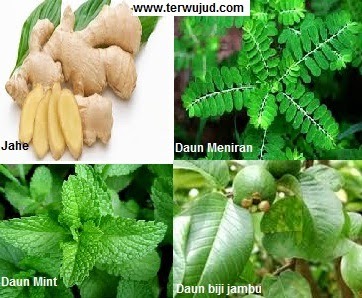 The main role dun Meniran is keeping one's immune system and is also able to cope with arthritis, hepatitis, dysentery, difficult urination, and kidney stones. Mint leaves also provide many health benefits for the body, which are able to cope with nausea, indigestion, nasal congestion, and the smell of bad breath. In addition, mint leaves can also serve as a guard skin health and is often used to treat acne to insect bites. Ginger is a plant long known efficacy to prevent and treat some diseases, it is because ginger is known to have security. Ginger serves as nausea drugs, overcome indigestion, and keep warm. The use of ginger as a natural remedy can be enjoyed as an aperitif with everyday, you can also add ginger drink with palm sugar or honey to taste bitterness is reduced. So that the maximum benefit and usefulness, do not use ginger too much, it can cause the body to become hot, then the use of ginger in the levels and amounts of vegetables. Guava leaves serve as foreign drugs that can be utilized as a cure acne and burns. How to use it can do by chewing directly or combined with a mixture of salt and honey. Other benefits of cashew leaf is able to treat diarrhea.